Whenever we see the tag as “Refurbished” or “used” we actually conclude that we are getting someone’s old system that doesn’t work anymore. This is the reason why some people don’t consider to buy the used servers. Obviously, servers are not like other products, where all the good things are already sucked up by the company who have used it in the first place. But in reality, if you buy refurbished servers from a reliable retailer you would know the efforts, they put to resale the products. The refurbished servers go through stringent testing procedures before being termed as “Fit Product” to sell. Whether you are replacing the server or you are a startup company thinking of buying a new server, the Refurbished server is not at all a bad idea. Obviously, you might be thinking why to consider the used servers that have been decommissioned by other server rooms and data centers. How that server would be productive for my IT environment? How it will perform the same level task for me? And the question goes on. Let’s see what the benefits of a refurbished Server are. A data center uses a server for approximately 2-3 years. Then there are chances of either replacing or upgrading to a new one. The productive life of the server manufactured these days are more than 5-10 years. You may not always have the same IT workload and data access speed requirement. As your business advances, workload increases with that arises the need for an upgraded server version. Rather than opting for the brand-new server and blocking your investment, it’s a good idea of investing less on refurbished servers. For your enterprise-grade IT hardware to be successful, you should pick a reliable company that can offer you the best-refurbished servers. These servers would have a longer shelf life and also provides great performance. Depending upon your current IT needs, and customer reviews select the server and the company. Make sure that the company you are dealing with would reset the servers thoroughly and give you the final product as good as a “new server”. The company you are buying the server from should be the best retailers around as they might focus on carefully testing and repairing the used servers properly. The refurbished server you are buying should also come with some warranty period. You can take advantage of the various benefits of a refurbished server if you have the right server in hand to meet your workloads. The refurbished server provides a guaranteed high level of performance and reliability. 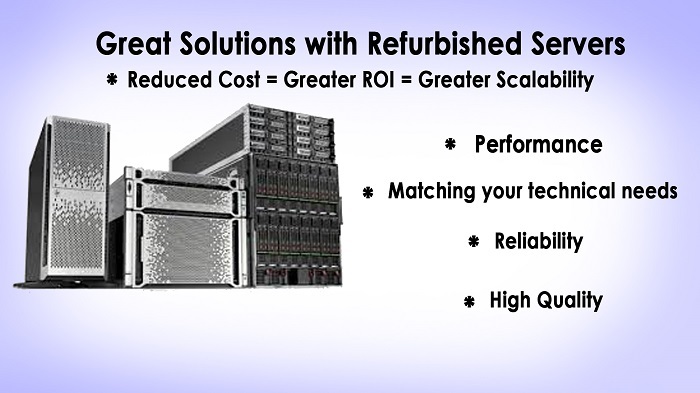 Buy refurbished server only if it comes at a very lower portion of the cost of new servers. Many would prefer non-brand servers. But I would suggest you go for the branded servers as it comes with other great features. Many servers can be configured as per your business requirement. You have different options for CPU, drive bays and other components. Here you can add on a lesser priced component so that your server is ready in the budget. Here you can experience significant savings as compared to the new hardware. A good refurbished server can perform well as the new ones. You can get the optimal performance from your server if it has the right configuration of processor, memory and drives. When carefully selected these servers may match the performance of a new server and sometimes even outperform them. For your applications like virtualization , 3D rendering, business data analytics and other demanding applications choose the servers wisely and probably of a well-branded company. Companies like Dell, HP, Cisco and IBM comes with varied in-built features that include the latest remote management technology and security features. The refurbished servers give more room for customization as compared to the new servers. Many retailers would ask your requirements and depending on that would assemble the server. This is a positive aspect as it is easier to replace the parts when something goes wrong rather than replacing the whole server. For your unique workloads and requirements, it’s better to buy an assembled refurbished server. When it comes to IT infrastructure , reliability is more important if you are working on mission-critical applications. Refurbished servers bought from the sellers with less reliability might sometimes end up with failed parts. You can have confidence with your refurbished servers when they come with a warranty period and are carefully tested and gone through the various procedure to be fully functional. When a refurbished server comes with a warranty period it means that individual components of the server are fully tested. The server goes through the various procedure of testing that may make it eligible for a certain warranty period. Also, the reliable retailers would make sure that the products are thoroughly cleaned and restored to the original factory settings. The products are tested at the component level and so these retailers have the confidence of offering the server with a minimum 90 days warranty. Which Retailer Or Service Providers You Should Consider??? 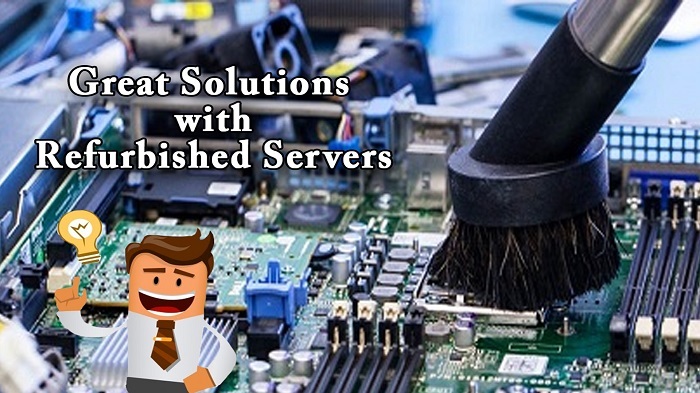 Only consider those refurbished server providers who have the right expertise and thus offer you the right server. Make sure you are getting the exact system you need. Many retailers with the refurbished servers also offer various services that would be more helpful for your IT infrastructure. So, while looking for a retailer, see what all free services it provides with the refurbished server. Also, ask them if they have 24/7 customer support. Check whether the vendors are willing to come to your location for offering on site support. Partnering with an experienced refurbished server retailer would also give you the privilege of fast shipping. The best retailer would make sure that the server reaches the customer within 2-3 business days securely at your doorstep. Electronic wastes are the major factors that contribute to poisoning the environment as it releases toxic metals. The waste can be well managed by recycling the electronics products and reusing it that too at an economical cost. Purchasing a refurbished server will result in reducing the amount of tech wastage . For startups and large enterprises those who are in need of savings, the refurbished servers are an attractive options. Cost savings will be relevantly very high and operations cost would be very low if you purchase a refurbished server from a reputed seller. When you pick up a Refurbished server, you will get a server that is good to like-new condition without sacrificing quality, performance and reliability .So by now you might have got to know the benefits of using a refurbished server for your business requirements. They can turn very useful provided you pick the right one and allocate resources for their maintenance. New servers are very costly whereas the refurbished servers come tagged with lower costs.